Dr. Ranjana Gupta is a well known Homeopath with an experience of over 19 years. She completed her Bachelor of Homeopathic Medicine and Surgery (BHMS) from State K G.K. Homeopathic Medical College, Moradabad, and Agra University in 1997. She is a professional member of the Indian Medical Association (IMA). Besides being a Homeopathy Practitioner, Dr. Ranjana Gupta is also an Allergy Specialist, an Alternative Medicine Specialist, and also an Infectious Disease Physician. According to Dr. Ranjana Gupta, Homeopathy renders long term cure for any disease by tackling the main core cause of the disease and not just by treating the symptoms that arise. 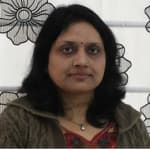 In 19 yearsof her career she has had excellent reviews by her patients and is hence considered one of the most trusted homeopaths in New Delhi. The treatment services provided by Dr. Ranjana Gupta include anti- ageing treatment, chin reduction treatment, weight management treatment, acne treatment, allergy treatment, asthma management program, dengue treatment, gastrointestinal disorders treatment, hair restoration technique, head and neck pain treatment, hyperthyroid treatment, hypothyroid treatment, Vaccinations, Migraine Treatment, Viral Fever Treatment, Nose Bleeding Treatment, Thyroid disorder treatment, Baldness Treatment, Capillary Treatment, Breast Examination, Treatment of Deep Vein ?Thrombosis, Diabetes Management, Exercise Plan, Family Planning, Gastric Treatment, Hair loss Treatment, Irritable Bowel Syndrome Treatment, Intra - dermal Treatment, Insomnia Treatment, Laser Treatment for Ringworm, Onychrocryptosis Treatment, Nutritional Assessment and Constipation Treatment. You can book a personal appointment with Dr. Ranjana Gupta at Sanjeevni Homeo Clinic in Dwarka, Delhi. ? Lupus - Ways It Can Be Treated! Examination Phobia - How Homeopathy Can Treat It? Exams are really tough times for most students irrespective of the level of their preparation. It is natural to get anxious before and during the exam time. Anxiety is a natural state in which people are either uneasy or fearful, depending on the situation that is making them anxious. Generally, students suffer from anxiety and fear when exam time approaches. People suffering from Generalized Anxiety Disorder usually feel nervous and anxious. They even experience fear in conducting routine tasks and worry a lot about the same. Students suffering from this anxiety tend to worry a lot during exam time even after knowing that they are fully prepared to take the exam. Usually, the sufferers here are unable to control their worrying. Phobia refers to the feeling of excessive fear for any particular thing or object or action. Phobia clearly interferes with the normal functioning of the individual and causes the sudden flow of adrenaline through his or her body. People suffering from any kind of phobia tend to avoid the cause or reason for their fear. Students mostly suffer from social phobias when it comes to exams and their performance. Panic Disorders are characterized by quick and intense fear. People suffering from this kind of anxiety disorder are prone to experience panic attacks - the situation that involves periods of intense fear and discomfort along with rapid heartbeat, nausea, shortness of breath and dizziness. Panic Disorder causes its sufferers to develop the anxiety of having panic attacks which further increases the problem. People suffering from Obsessive Compulsive Disorder usually feel compelled to act in a certain way which doesn't appear normal to others. The kind of obsessions people feel due to this ailment include checking if a door is locked repeatedly or washing hands again and again, and so on. Students usually suffer from generic anxiety disorders before and during the exam. An apt amount of anxiety leads to great results as it makes the person serious about his or her goals and focus on the same. Hypothyroidism - Possible Ways It Can be Treated! The thyroid gland plays a major role in most of the metabolic processes that occur in the body. This is due to the hormones it produces. Disorders in thyroid can go from a little, innocuous goiter (enlarged gland) that needs no treatment, to fetal growth. The most widely recognized thyroid issues include irregular generation of thyroid hormones. Hyperthyroidism is a condition that occurs due to presence of excess thyroid hormones. Inversely, hypothyroidism is caused due to insufficient hormone production. It is common that people with this condition will exhibit symptoms associated with slow metabolism. There are two genuinely regular reasons for hypothyroidism. The first is a result of past (or current) irritation of the thyroid organ, which leaves a vast amount of the cells of the thyroid harmed (or dead) and unequipped for providing an adequate amount of hormones. The most widely recognized reason for the failure of thyroid organs is called autoimmune thyroiditis (also known as Hashimoto's thyroiditis), a type of thyroid irritation brought about by the patient's own immune system. The second significant cause is the general class of medical treatments.The treatment of numerous thyroid conditions requires surgical removal of a segment or the greater part of the thyroid gland. In the event that the aggregate mass of thyroid delivering cells left inside the body are insufficient to address the issues of the body, the patient will experience hypothyroidism. It is to be noted that this is regularly the objective of the surgery for thyroid cancer. Symptoms of hypothyroidism include weakness, constipation, memory loss, irritability, fatigue, etc. It is totally treatable in numerous patients basically by taking a little pill once per day. However, it is usually more complicated. The medication comes in different varieties, which implies that a fitting dose can quite often be found for every patient and be re-assessed annually. A few patients will notice a slight decrease in indications in 1 to 2 weeks, yet the full metabolic reaction to thyroid hormone treatment is regularly deferred for a month or two preceding the patient feels totally typical. It is imperative that the right measure of thyroid hormone is used. After around a month's treatment, hormone levels are measured in the blood to set up whether the dosage of thyroid hormone, which the patient is taking is proper. Weight Management - How Homeopathy Can Help You Do It? Obesity or excessive weight is a common problem for both men and women irrespective of their age. Obesity must not be ignored as it can lead to further complicated health problems like heart diseases and asthma. Different causes are responsible for excessive weight gain, such as hypothyroidism, depression or polycystic ovarian disease among many others. Antimonium Crudum: This medicine is advised to children or young people suffering from excessive and inappropriate weight. If symptoms like thick white coat on the tongue, discoloration of nails, craving for salt, irritability are noticed in a child or young person, then the doctor may recommend this medicine. Calcarea carbonica: This medicine is recommended if fat gets accumulated in the abdominal region. It helps to lose fat from the abdomen region. It is also given to a person showing the symptom of excessive perspiration. Lycopodium: It is administered to people showing symptoms like depression or excessive craving for sweets. It helps to lose weight from the thigh or buttock region. Graphites: This may be advised if you show symptoms like fatigue, weakness or depression. It is mostly suggested to women. Nux vomica: This may be recommended if you have gained weight due to inactiveness. If symptoms like constipation or sensitivity to cold air are noticed, then this may be advised. Ignatia: Ignatia is generally advised if you gain weight due to depression. Natrum Mur: This medicine may be advised to lose weight from the thigh and buttock region. It is given to people showing symptoms like depression, sensitivity towards heat or sun. Phytolacca: This is one of the most common medicines suggested by doctors for weight loss. If you show symptoms like swollen glands, pain in the ear or feel dryness in your throat, then this may be advised to you. It is highly recommended for you to consult a homeopathic doctor before taking any medicine in order to find out the root cause of your weight gain. HIV / AIDS - Role Of Homeopathy In Treating It! Acquired Immune Deficiency Syndrome(AIDS) is caused by a virus called Human Immunodeficiency virus (HIV). It should be remembered that it is not necessary that a person having HIV is suffering from AIDS or will inevitably result in it. The illness damages the immune system of the person and makes them more vulnerable to diseases and infections. As the syndrome progresses, opportunistic infections attack the patient, ultimately causing their death. 2. By sharing the same needle or through blood transfusion. 3. The disease can be spread from mother to the newborn child. 1. You may have a high fever or suffer from constant diarrhea which may last for weeks. 2. Red rashes may appear on your skin. 3. You may feel weak and tired all the time. 4. You may have excessive sweating, particularly at night. 5. Your muscles and joints may ache. 6. Your swollen glands don’t heal for weeks. What are the complications related to AIDS? 1. Infections to the nervous system like meningitis, peripheral neuropathy. 2. Inflammation in the lower end of the esophagus. 3. Cancers like cervical cancer, neck cancer, and lymphomas. Can AIDS be treated with homeopathy? These medications can be used in conjuction with ART or antiretroviral therapy along with other treatments and has been shown to be very effective in alleviating some of the commonly encountered symptoms of AIDS related complications. But utmost care must ensured and these medicines should not be taken without consulting a homeopathic doctor. Headache Due To Heat - Side Effect Free Treatment With Homeopathy! Stress - 7 Foods That Can Help Fight It! Chocolate: Chocolate is one of the best stress busters. It contains magnesium, phenyl ethyl amine and carbohydrates, all of which help lift your spirits. Chocolate helps in the reduction of stress hormones, helping you to relax. Coffee: Coffee helps your brain signal the production of BNDF (a brain derived protein), which helps to keep your brain cells healthy. A low level of BNDF can cause a lot of stress and depression. Coffee triggers many neurotransmitters which control your mood changes; so may be a cup or two of coffee will help your to be chirpier. Green leafy vegetables: All green leafy vegetables like spinach contain a high quantity of magnesium. Magnesium prevents headaches and fatigue, which in turn reduces stress. Black Tea: Black tea can relieve you of stress, quicker than any other food item. Black tea reduces the amount of cortisol, a hormone which causes stress, and gives you a feeling of calmness. Milk: Milk contains calcium, which is known to ease anxiety and control sudden mood swings related to PMS or post menstrual stress. Bananas: Bananas have a huge content of dopamine which is a natural chemical that works towards boosting your mood. This is the same chemical released in your body after a session of working out. Bananas also have a lot of potassium and B group vitamins which work towards soothing your nervous system, and a lot of magnesium which brings in positivity to your mood. Almonds: Almonds are rich in Vitamin E and group B vitamins, which will help you to be more resilient when you are depressed or anxious. So if you are stressed out, pop in a few almonds or have a cup of tea, and release your stress. Spinach - A Super Food That Is Must For You! While we all believe that green leafy vegetables are to be included as part of our regime, not all of us know in detail the amount of goodness that comes packed in these. The first thing that comes to mind at the thought of leafy green vegetable is the tender, green, luscious looking spinach. However, not all of us know the amount of goodness and nutrition it stores within in. Spinach, though appears to be delicate and light, puts up a strong fight against inflammatory problems, stress-related problems, cardiovascular issues, bone diseases and various types of cancers. 1) Minerals and vitamins - Fresh green spinach is loaded with a multitude of vitamins A, B1, B2, B3, B6, C and K. Major minerals contained in spinach include manganese, iron, magnesium, copper, potassium, phosphorus and selenium. 2) Anti-cancer benefits - The antioxidant properties in spinach come from carotenoids and flavonoids, and it is loaded with about a dozen flavonoid compounds, thereby getting a strong anti-inflammatory and anti-carcinogenic properties. Spinach helps in reducing inflammation in the stomach lining and other areas, thereby reducing the chances of intestinal cancer. It also provides significant protection against prostate cancer. The incidence of skin papilloma is also reduced with increased consumption of spinach. 3) Anti-inflammatory benefits - The good amounts of vitamin C, E, A, zinc, manganese, selenium are beneficial for reducing stress and thereby reduce incidence of heart attacks and high blood pressure. Spinach also is rich in protein and contains some peptides (small protein units) which inhibit angiotensin-converting enzyme that is responsible for increasing blood pressure. This is another way how spinach helps lower blood pressure. 4) Eyes - Lutein and zeaxanthin are two carotenoids which protect the eyes against cataracts and macular degeneration. 5) Bones - The bacteria in the stomach convert vitamin K1 in spinach to vitamin K2. While Vitamin K1 supports the bones by reducing the number of osteoclasts (cells that break down bones), vitamin K2 activates osteocalcin, which promotes bone formation. The high levels of calcium and magnesium only make it even better for the bones. 6) Digestive system - With the good fiber content it has, there are reduced instances of constipation. The anti-inflammatory property helps keep the stomach lining healthy and less prone to ulcers. It also helps flush out toxins and keeps the body alkaline, which helps beat stress. 7) Skin - The various minerals and vitamins in spinach reduce the chances of skin infections and also add to the glow of the skin. The itchiness and dryness of the skin also are reduced with regular use of spinach. So, the next time you are thinking which is one thing you should pick up when you go to the market - think spinach. Popeye did, and it sure did help him!! Skin Ailments & Their Homeopathic Treatments! The skin covers and protects all parts of the body. It is also most exposed to the outside world including the dust, pollution and other environmental pollutants. Smooth, healthy, glowing skin is what most of us desire, in addition to diet, lifestyle and stress produce various changes to the skin, which are just totally undesirable. In addition to the cosmetic effects, they also have a huge psychological bearing on a person. Imagine a person with acne-filled face, or a person with eczema on the hands, or a person with warts on the neck. They are obviously embarrassed and try to hide the affected part with clothing. Acne: Acne is a common skin disease that causes pimples. Pimples form when hair follicles under your skin clog up. Most pimples form on the face, neck, back, chest, and shoulders. Anyone can get acne, but it is common in teenagers and young adults. It is not serious, but it can cause scars. Psoriasis: Psoriasis is a noncontagious skin condition that produces plaques of thickened, scaling skin. The dry flakes of skin scales result from the excessively rapid proliferation of skin cells. The proliferation of skin cells is triggered by inflammatory chemicals produced by specialized white blood cells called lymphocytes. Psoriasis commonly affects the skin of the elbows, knees, and scalp. Eczema: Rather than a specific condition, eczema is a group of unrelated diseases that have a similar appearance. When it is new eczema, the affected skin appears red and elevated with small blisters (vesicles) containing a clear fluid. When the blisters break, the affected skin will weep and ooze. In older eczema, chronic eczema, the blisters are less prominent and the skin is thickened, elevated, and scaling. Eczema almost always is very itchy. Warts: Warts are raised bumps on your skin caused by the human papillomavirus (HPV). Wart viruses are contagious. Warts can spread by contact with the wart or something that touched the wart. Warts are often skin-colored and feel rough, but they can be dark (brown or gray-black), flat, and smooth. Urticaria: Hives, also known as urticaria, affects about 20 percent of people at some time during their lives. It can be triggered by many substances or situations and usually starts as an itchy patch of skin that turns into swollen red welts. The itching may be mild to severe. Scratching, alcoholic beverages, exercise and emotional stress may worsen the itching. Graphites: In patients with eruptions on the face, scalp, various joints, which are extremely itching, scaly, and dry, graphites is used. These people have dry hair with increased hair fall. Lycopodium: If the eruptions are dry and scaly, this can be used. Causticum: This is again widely used in treating warts, acne, and psoriasis. Calcarea: Eczema which covers the scalp and the face with white crusting, which is extremely itching especially in the morning. This is also useful in solitary warts which are round and hard. Sulphur: The sore skin has pustular eruptions. The scalp is dry but hot to the touch. There is a great tendency to scratch, especially at night. This is also the first choice to treat pustular acne, warts, and urticaria. It also helps in removing old scars from acne. A word of caution, it can cause exacerbation of symptoms, and this should not cause panic. Puslatilla: Acne is often associated with puberty, and in young girls, this is commonly used where there is an association with menstrual cycles. Antimonium crudum: This is widely used in warts that can be single or in groups, hard or smooth. There could be associated digestive issues and irritability. With treatment for most of these skin troubles, there would be a dramatic improvement in the person’s mood before the actual skin problems improve. The person also would feel more motivated with higher energy levels. This is one of the major benefits of homeopathy, where not just the symptoms, but the person’s overall quality of life improves without any known side effects. Back Pain - Role Of Homeopathy In Treating It! Homeopathy, with its plethora of medicines, serves as a better alternative as compared to its allopathic counterpart in curing back pain permanently, both acute as well as chronic. Homeopathic remedies are completely natural remedies without any side effect whatsoever. Arnica: If the cause of your back pain is an injury, Arnica can be one of the best homeopathic medicines. In this sort of a pain, you experience stiffness and soreness at the back of your muscles. Bryonia: If your backache worsens with movement, Bryonia can help to cure this problem. You experience a stiff and tearing pain which worsens in humid and hot conditions. Try not to lie on a soft surface if you experience this sort of a pain. Proper rest with this medicine is suggested. Kali Carb: Kali carb is best in treating low back pain, especially in females after a delivery. This medicine caters to the sort of a pain which renders a great amount of weakness to your back muscles. Mag Phos: It is one of the best homeopathic remedies if you experience a sort of a pain, which is relieved by external application of heat. Pain, both of acute and chronic stages, can be cured by this medicine. Rhus tox: If your pain gets worse with movement, Rhus-tox is one of the most potent homeopathic remedies which can treat the issue. This sort of a pain causes stiffness in the back and at times, gets aggravated when you are resting. Bellis Per: This homeopathic wonder takes care of pain which is chronic, or which has been left untreated since a long time. Any surgical related back pain problem can also be remedied by this medicine. Even though some of the medications are mentioned here, it is better to take proper advice from your homeopathic practitioner, as the dosage and frequency must be decided by your doctor only based on the symptoms and your medical history.